For one day only, the land down under's Maurice Terzini and his crew from Icebergs Dining Room and Bar will trade in their Australian, Bondi Beach views and ocean pool for the clutch sights of the Hollywood Hills and the Sunset Strip. Joining forces with fellow Australian friends, restaurateurs Grant Smillie and David Combes, alongside E.P./L.P. 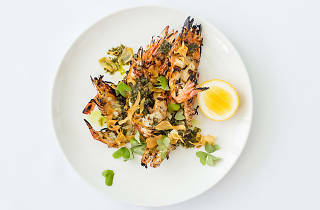 's Aussie-Fijian executive chef, Louis Tikaram, they'll be slinging a family-style meal of grilled Skull Island prawns with smoked garlic butter; cavatelli with clams and shellfish oil; roasted lamb shoulders and more. Afterward, head up to the rooftop for a party—beginning at 4pm—with cocktails, music and Icebergs-made snacks.